Chowk Bazar Shahi Mosque also known as Chowk Mosque is one of the oldest Mosques in Dhaka. 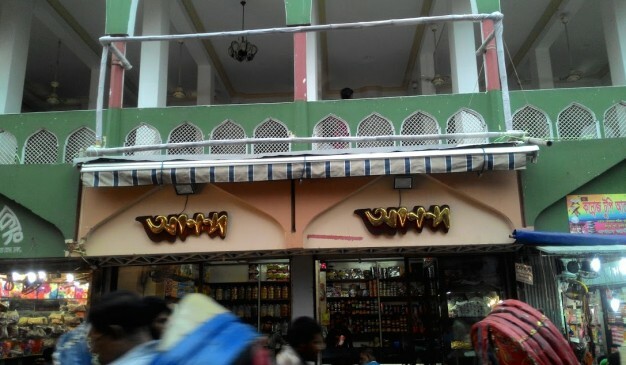 It is located in the Chowk Bazar area of the old town of Dhaka, south to the current city center. 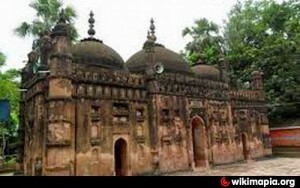 The mosque was constructed in 1676 by Subahdar Shayesta Khan (সুবাহদার শায়েস্তা খান). It is called ‘Shahi Mosque’ as it is founded by Subahdar Shayesta Khan. The mosque is built above a raised platform. 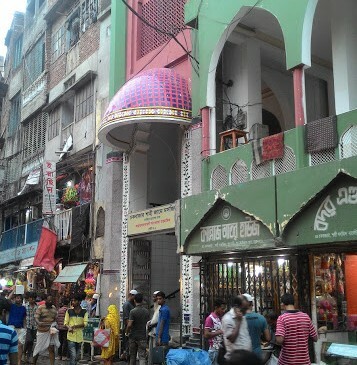 The three domed mosque above the platform, now transformed into a multi-storied structure was originally a copy of Shayesta Khan’s another three domed mosque at the Mitford Hospital compound near the Buriganga River. Some square shaped rooms may be built for Imam and for students of the Madrashah. As a result of several renovation & reconstruction work, this mosque has lost its ancient original view. History: This Mosque was constructed in 1676, as noted by an inscription in the Persian language over a gateway. The inscription attributes the project to Subahdar Shaista Khan. So far, this is known as the earliest dated mosque in the History of Muslim Architecture in Bengal, built on a high vaulted platform. Its architectural design was perhaps influenced by Tughlaq Architectures; such as Khirki Masjid or Kalan Mosque of Delhi. 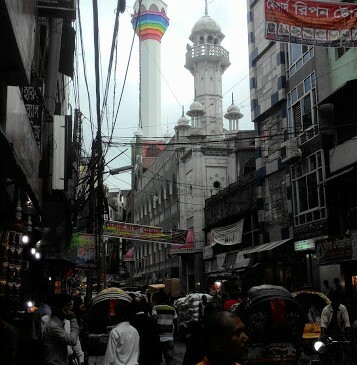 Influenced by this structure, some other mosques were built in Dhaka and Murshidabad. Architectural Properties: The western half of the 3.05 meter high vaulted platform (28.65 meter from north to south and 24.38 meter from east to west) is occupied by the original three-domed mosque. It measures, inclusive of the four octagonal towers on the exterior angles, 16.15 meter by 7.92 meter. There are three four-centered archways in the east, all opening out under half-domed vaults. The half-domed vault of the central archway still contains beautiful Muqarnas works in stucco. Corresponding to the three eastern entrances, there are three Mihrabs inside the west wall, all now redesigned. The central mihrab still has a semi-octagonal aperture, while its flanking counterparts are rectangular in design. The mihrabs are now all studded with lustrous pieces of enamel. The rectangular frames enclosing the mihrabs are now topped by rows of painted cresting. The floor of the mosque is now laid with marble. Three bays divides interior view of this Mosque- the central one square shaped and the side ones are rectangular. All these bays were covered with domes, the central one being bigger than its flanking counterparts. This can be deduced from the newly built three-domed prayer chamber exactly above the original one, where the central dome has been kept larger than the side ones. The vaulted rooms, all round underneath the platform, are either square or rectangular in shape. Many of them are now let out to shopkeepers and others are still being used as accommodation. The under ceilings of these rooms are flat on the top and barrel-shaped at the sides. Very uniquely designed and Space utilized Madrasa & Mosque: The promenade around the three domed prayer chamber, since there was no separate structure for study purpose, might have been used for open-air classes and the vaulted room with book-shelves on their walls underneath the platform may have been designed to provide residential accommodation for those who used to teach and study here. In that perspective, Chawk Mosque may be regarded as the first known example of Residential Madrasa Mosque. It is an ingenious way of accommodating two structures-a madrasa and a mosque in a single building which not only saved space but also a considerable amount of money. From Gulistan Bus stop it is near about 3 Km south-west. You can ride on Rickshaw or auto-rickshaw to reach there. If your first destination is Lalbagh Fort, then it is just 1.3 km south-east ward from the Fort. As soon as you get there in the Mosque, try to figure out the real picture of this old Mosque and Madrasa. Experience the artistic beauty of Mughol architecture. If you are kind of food lover, then there are so many options awaiting for you. 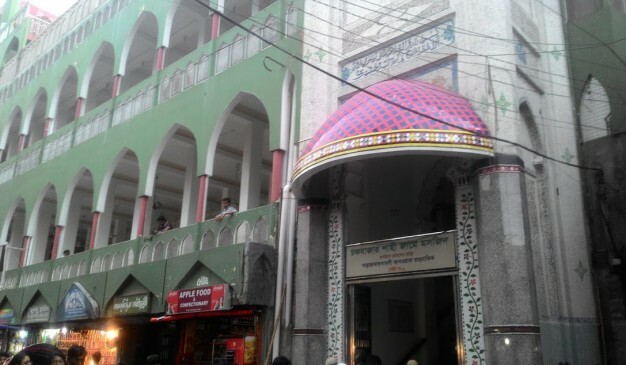 Mohammad Ali Chowdhury Mosque is located at Sharshodi, Feni Sadar Upazila. The Naib Nazim of Dhaka appointed Muhammad Ali Chowdhury as the Fouzdar of Feni in 1762. Muhammad Ali Chowdhury revolted against the British; as a result he lost his Zamindari in 1790. 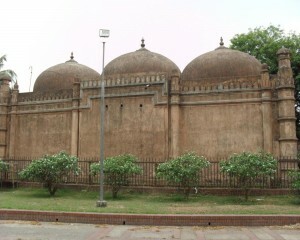 Khwaja Shahbaz, the founder of the mosque was a prominent merchant of Dhaka. In fact, prominent is not the paragon for him. People used to call him as "Merchant of Prince". 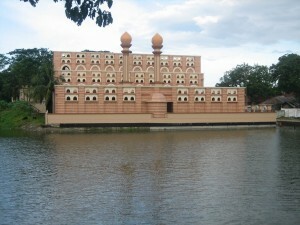 According to the history of the mosque, it was built at 1679 AD in the surrounding of the Ramna Park. The mosque has three large Domes, and the architecture is almost similar to the structures at the era of Mughal (Shaista Khan). The measurement of the mosque is exactly 20.73 m by 7.92m. It is comprises with three front doors, where the middle one is a bit larger compare if you compare with other two. As a commemoration, the mosque premise has a tomb of the founder of the mosque. The tomb is decorated with only a single dome. The southern part of the tomb has a nicely shaped veranda with a curvy roof. Inside the tomb, there is something which is covered with red cloth. Each corner of the mosque or the tomb has a firmly built pillar, which are lovely to examine. The baroque style of the pillar will certainly impress you. Neither the mosque nor the tomb has any window. That's why when you'll look inside the tomb or mosque, you'll find it a bit darker, no matter how sunny the day is. Finally it is strictly forbidden for the women for "Jumma Prayer" at Friday. Using a notice board at the facade of the mosque, it’s proclaimed that they have no facilities for women for Jumma Prayer. 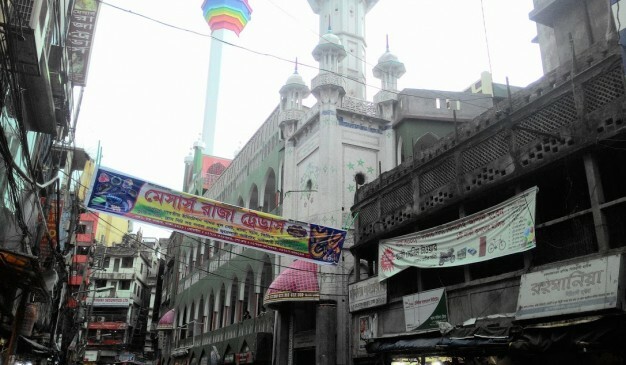 Belabo Bazar Mosque,a grand mosque constructed with Tk 35 million, was inaugurated on 8th of November 2008. At least 12,000 people can say their prayers at a time at the mosque of 200 feet length and 125 feet width. Renowned industrialist of Narsingdi district Abdul Kadir Mollah carried the whole construction cost of the mosque. 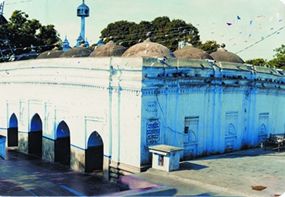 The first founder and land owner of the Moque named 'Alhajj Mahmud Ali Bhuiyan' donated his land for building this Mosque. Who is known as 'Mamdi Bepari'. Later Abdul Kadir Mollah announced his grand donation on a public place in Belabo to build this Mosque as a Mega Structure. Local people feels proud to be the inhabitants of this Upazila. Many people from different direction come to visit this Mosque everyday.